"Sampath Speaking" - the thoughts of an Insurer from Thiruvallikkeni: BCCI website down ~ and the Lalit Modi connection !! BCCI website down ~ and the Lalit Modi connection !! Players line up before the match and do notice the copyright mark up there on the photo !!! 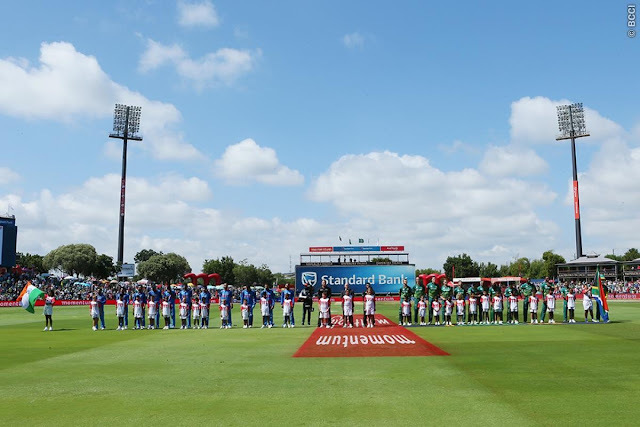 The 2nd ODI at Centurion was a delight to Indian fans ~ the toss and the Umpire’s decision on lunch made headlines ~ and there is one more trivia, the official website of BCCI. Do you still rememner Lalit Kumar Modi ~ those watching IPL would ! - the businessman was the first Chairman and Commissioner of the Indian Premier League (IPL), and ran the tournament for three years until 2010. He also served as the Chairman of the Champions League during 2008–10. He was the Vice President of the BCCI – all a thing of past, as he now lives in exile. Would you ever have imagined that he will continue to have his clout on the Board ?? Its past Presidents Include : RE Grant Govan, Digvijaysinhji, Anthony D Mello, Maharajkumar of Vizianagaram, MA Chidambaram, Fatehsingrao Gaekwad, M Chinnaswamy, SK Wankhede, NKP Salve, S Sriramam, Madhavarao Scindia, AC Muthiah, Jagmohan Dalmia, N Srinivasan, Vinod Rai and in interim – Shivlal Yadav and Sunil Gavaskar. – it is the BCCI ~ the Board of Control for Cricket in India, the national governing body for cricket in India. The board was formed in December 1928 as a society, registered under the Tamil Nadu Societies Registration Act. It is a consortium of state cricket associations and the state associations select their representatives who in turn elect the BCCI officials. Lalit Modi, the icon of IPL, was banned by the Board of Control for Cricket in India (BCCI) since 2010 and forced to live in exile in London over allegations of financial misappropriation, but the spectre of former IPL czar Lalit Modi continues to hang over the board. On Saturday — a day when India won the Under-19 World Cup in New Zealand — the Board was faced with the embarrassment of finding its website, bcci.tv, dysfunctional. TOI reports that the glitch happened because BCCI's internet domain is still owned by Modi, who had not paid for the renewal in time. The domain was valid from February 2006 to February 2018. The updation date was February 3, 2018. Since the website is under Modi's control following a court order, he is believed to have made the payment for renewal after the BCCI approached Modi's staff in India. The site is now up. TOI spoke to Modi's lawyer and he said he was not aware of the issue.